Hvolsvöllur is a small town in the south of Iceland about 106 km to the east of Reykjavík.It is situated in the inland swamps of Landeyjar, in the municipality of Rangárþing eystra and has, as of January 2015, 934 inhabitants.OverviewThe name of the town literally translates to "Hillfield". Start off your visit on the 21st (Fri): take a pleasant ride with a tour on horseback, get a new perspective on nature at Lava Centre, then look for gifts at Una Local Store, and finally admire the sheer force of Gluggafoss/Merkjarfoss. To find maps, photos, reviews, and tourist information, go to the Hvolsvollur trip planning app . Syracuse, USA to Hvolsvollur is an approximately 15-hour flight. The time zone difference moving from Eastern Standard Time to Greenwich Mean Time is 5 hours. Traveling from Syracuse in June, you will find days in Hvolsvollur are much colder (51°F), and nights are slightly colder (47°F). Cap off your sightseeing on the 21st (Fri) early enough to go by car to Vik. 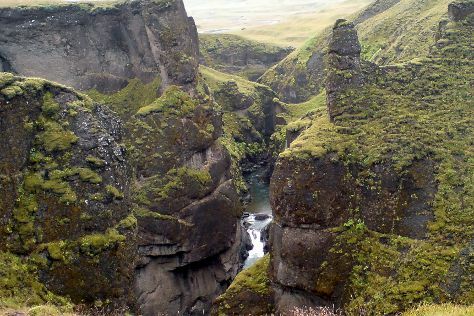 On the 22nd (Sat), take in the dramatic natural features at Mýrdalsjökull, trek along Sólheimajökulll, then hike along Fimmvorduhals Hiking Trail, and finally Head underground at Rutshellir Cave. 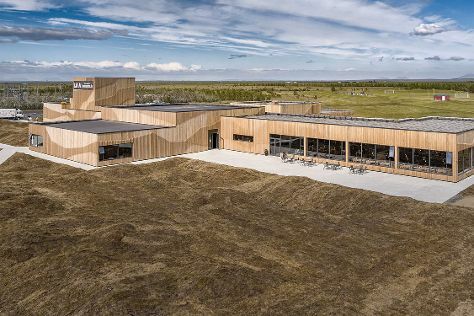 Get ready for a full day of sightseeing on the 23rd (Sun): trot along with a tour on horseback, then stop by Wool Gallery Vik i Myrdal, then explore the striking landscape at Dyrholaey, and finally tour the pleasant surroundings at Reynisfjara Beach. To find reviews, ratings, maps, and tourist information, refer to the Vik trip maker site . You can drive from Hvolsvollur to Vik in 1.5 hours. Another option is to take a bus. 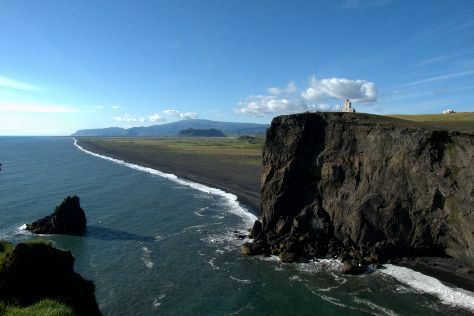 June in Vik sees daily highs of 51°F and lows of 47°F at night. Cap off your sightseeing on the 23rd (Sun) early enough to go by car to Kirkjubaejarklaustur. On the 24th (Mon), take in the dramatic natural features at Skaftareldahraun, take in the dramatic scenery at Stjornarfoss, then take in the dramatic scenery at Systrafoss, then immerse yourself in nature at Skaftarstofa, and finally take in breathtaking views at Fjadrargljufur Canyon. To see other places to visit, where to stay, maps, and tourist information, refer to the Kirkjubaejarklaustur trip itinerary planning app . You can drive from Vik to Kirkjubaejarklaustur in 1.5 hours. Alternatively, you can take a bus. Cap off your sightseeing on the 24th (Mon) early enough to travel to Akureyri. On the 25th (Tue), see majestic marine mammals with a dolphin and whale watching tour, then take in the dramatic scenery at Godafoss, and then contemplate the long history of Saurbaejarkirkja. Keep things going the next day: hit the best photo ops around with an inspiring photography tour, then shop like a local with Linda Ola - Studio & Gallery, then look for gifts at Flora, Akureyri, and finally contemplate the long history of Matthiasarhus. To see traveler tips, photos, where to stay, and other tourist information, use the Akureyri visit planning website . Traveling by combination of bus and flight from Kirkjubaejarklaustur to Akureyri takes 8 hours. Alternatively, you can drive; or take a bus. In June, daily temperatures in Akureyri can reach 56°F, while at night they dip to 44°F. Finish your sightseeing early on the 26th (Wed) to allow enough time to travel to Reykjavik. Kick off your visit on the 27th (Thu): take in panoramic vistas at Perlan, view the masterpieces at Kogga - Ceramic Studio - Gallery, stop by foa, then wander the streets of Laugavegur, then take in the exciting artwork at Dead Gallery/Studio, and finally take in the architecture and atmosphere at Hallgrimskirkja. Keep things going the next day: take an in-depth tour of Reykjavik Open Air Museum and then cast your line with a fishing tour. To see photos, more things to do, and other tourist information, read our Reykjavik attractions site . You can fly from Akureyri to Reykjavik in 2.5 hours. Other options are to do a combination of flight and bus; or drive. In June in Reykjavik, expect temperatures between 55°F during the day and 46°F at night. Finish up your sightseeing early on the 28th (Fri) so you can travel back home.